I drove some of the roads we would be riding - the roads were wet and there were many large puddles that will freeze solid overnight. Out of an abundance of caution I am going to cancel. 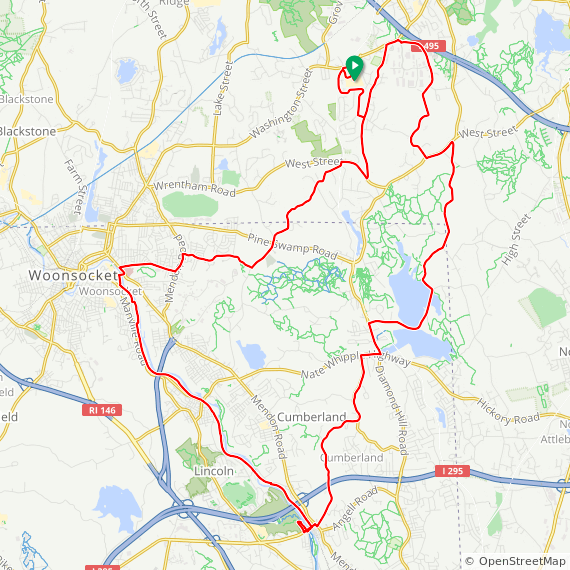 This ride begins in Franklin goes into Wrentham and then into Cumberland, Woonsocket and Lincoln, Rhode Island before coming back into Wrentham and Frankin. A section of the ride is on the (fully paved) Blackstone River Bike Path and then goes through the Diamond Hill Reservoir. At ~ mile 26 we will pass the Big Apple that has cider donuts and other goodies (as well as fruit) at this time of year. After the ride, Coles Tavern (553 Washington Street, Franklin) is nearby the end point, if lunch is in your plans. I am not aware of a speed limit on the Bike Path - I will ride whatever the traffic will tolerate and have been passed by others when I am doing 18-20 mph. From North or South -- I - 495 to Exit 16 (King Street, Franklin). Take King Street toward Woonsocket, RI. King becomes Washington Street at a flashing yellow light. The school entrance has a sign, and is on the left.